Kennel free Dog boarding. Happy Tails. Auburn, Issaquah, Maple Valley, Enumclaw, Buckley, Bonney Lake. Dogs Doing What They LOVE: Running, Playing, Digging, Sleeping! If they want to chase or be chased, there is always someone willing to oblige. Maybe they just want to quietly explore by themselves, or chase a bird, or sprawl out on the grass to soak up some rays on a summer day. And let's face it, the cows on the other side of the fence are funny lookin' and are an endless source of intrigue. Tina helps Watson improve his manners. Dogs love playing with Andrew. Morning starts with the first out between 7:00am and 7:30am, back inside for breakfast by 8:00am. After breakfast, the dogs stay in for a minimum of one hour so they’re not out running around with full bellies. We try to get our morning appointments taken care of before the dogs come back out by 10:00am or 11:00am. Throughout the day groups of dogs are periodically rotated into different yards, so that each group gets plenty of time out in the main yard. Around 4:00pm or 4:30pm the dogs go back inside for a nap before dinner. Between 5:00pm and 6:00pm the dogs come back out for about thirty minutes while dinner is dished up. After dinner they are again inside for a minimum of one hour to let dinner settle. Usually by this point they stay inside until 9:00pm or 9:30pm then come back in for the night by 10:00pm or 10:30pm. Eating their favorite foods - same as at home - they feel more at home and no upset tummies. As much playing as they want in our kennel free environment. Six large fenced play yards with trees, birds and wide open spaces. Dogs and humans to play with. Getting to play with toys from home, or ours (we have plenty). Plenty of healthy cookies and treats for good manners. Personal kennels to relax in. Trained professionals keep everything running smoothly and everyone happy. 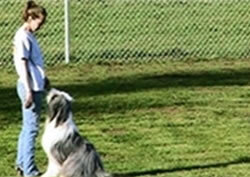 The health and well being of your dog is our top priority. All dogs maintain or polish their good manners. Natural, healthy environment for dogs (and humans) with extra large yards for play. 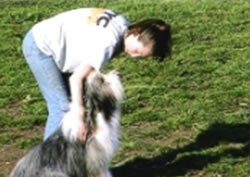 Your dog looks and feels great when you pick him up - he's enjoyed plenty of exercise, ate well because he was hungry, slept well because he was tired and relaxed during his stay. When you pick up your dog you'll know he's really enjoyed himself - he'll say hi at the gate then may be off and running to play with his dog friends. When you return to board your dog again he'll be pulling on the leash to get to the gate as soon as you let him out of the car. We cater to your dog's needs and preferences - whether that means running & playing with others, or just hanging out by himself or with us. Your dog's food - same as they eat at home, this avoids upset tummies. County code requires dog food to be in an airtight container. Anything from home that your dog would like (blankeys, toys, special treats, etc) - as long as it's not alive! Payment in full upon arrival. Check out our competitive rates, make dog boarding, dog daycare or puppy daycare reservations, or contact us today for more information or a tour, 360-825-0604. 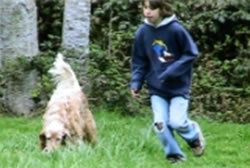 © Copyright 2005- , Happy Tails Dog Boarding & Daycare - All rights reserved.